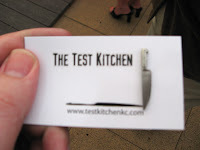 The Test Kitchen is a totally cool concept. 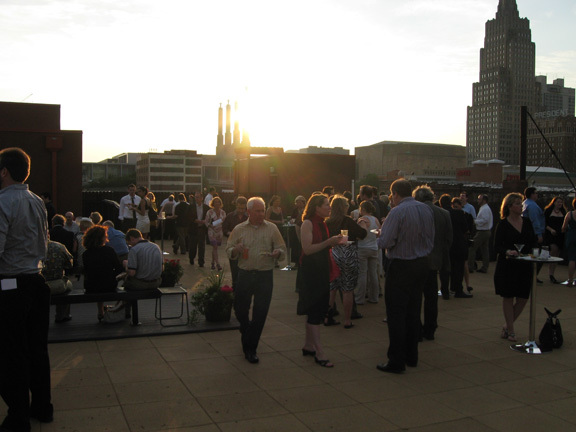 It’s an underground supper club where prestigious Kansas City chefs prepare fancy meals for a select number of guests at secret locations. Ever since learning about The Test Kitchen, I’ve wanted to attend one of these events. However, as befitting something with this air of surreptitious exclusivity, the recommended donations are usually kind of steep and that’s kept me from entering the lottery for seats. So when I got the invitation for The Test Kitchen’s Ultimate Cocktail Party and saw that this time around the recommended donation was a more doable $40, I wasn’t going to miss out. Shaw and I put our names in the lottery, and a couple of days later I was way excited to get the email telling us we were go. Here’s how all that works. First, you sign up at The Test Kitchen’s website to get on the mailing list for upcoming events, announced via save the date emails. Shortly after the save the date emails go out, they’re followed by invitations that include more detailed info about the chef and menu, plus the amount of the recommended donation. If you want to attend, you reply to the invitation and are entered into the lottery. Those lucky people that score seats are notified by email and once they’re paid up, only then are they told the whereabouts of the big night. The Ultimate Cocktail Party was held at The Terrace on Grand on Tuesday, May 25, and when we arrived a couple of minutes after 7 p.m., the doorman told us the underground supper club was actually meeting on the roof. We took the elevator up and were greeted by The Test Kitchen's Founder [REDACTED], and then promptly got in line for drinks. Tonight’s cocktails were being prepared by Manifesto’s Ryan Maybee, and he was offering two selections. 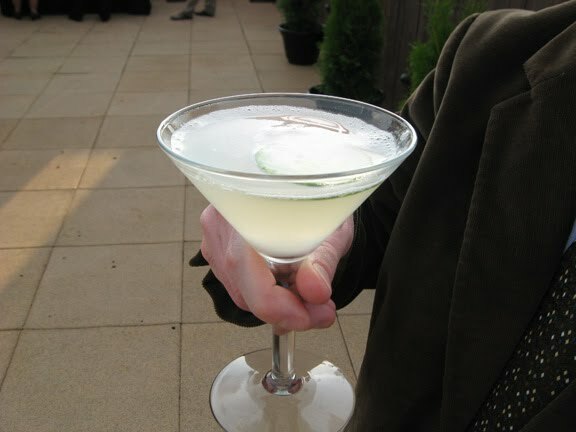 We started with the Word on the Street, made with Hendrick’s Gin, St. Germaine Elderflower Liqueur, Thatcher’s Organic Cucumber and fresh lemon juice. I am solidly against cucumbers except for when they are pickles -- although unsurprisingly it turns out I don’t mind cucumbers when they’re soaked in booze, either. As good as the Word on the Street was, I preferred the Equinox. 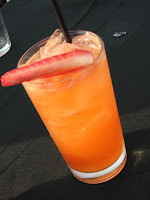 It was made with Reposado Tequila, Aperol, strawberry-sage syrup, fresh lime juice and a splash of ginger beer. The kick of the ginger beer is really what did it for me -- more drinks should have ginger beer in them. While we were enjoying our cocktails, I saw somebody I knew in the line for drinks, which by that point had grown crazy long. Walking over to say hello, I tripped and spilled a couple of drops -- a few thirsty people watched that happen, and registered understandable looks of horror. I deserved every nasty glare. 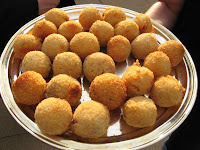 Meanwhile, Chef Howard Hanna of the Kansas City River Club was serving up small bites. Among them were some rather delicious deviled quail eggs with caviar. 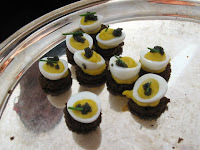 I’d never had quail eggs before, and to me they were much eggier than the chicken variety. Following our trip to Benton’s Prime Steakhouse, this marked the second time I’ve had caviar, and I still have no concept of what it tastes like. There was also a creamy and awesome chicken liver pate. On our second trip through the line, there was hardly any left. 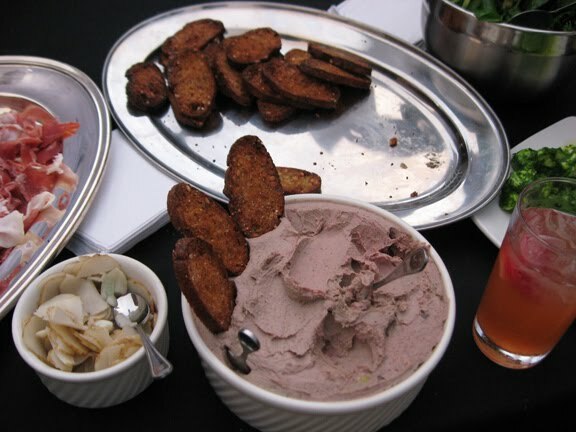 I’m not ashamed to say that with some encouragement from one of the servers, I used a slice of grilled bread to scoop up as much of the pate from the bowl as I could. 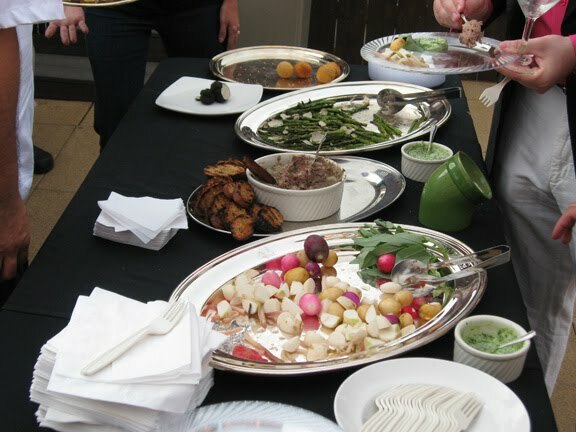 Rounding out the small bites were grilled asparagus with Umbrian black summer truffles, heirloom radishes and baby turnips with ramp aioli, Shatto cheese curds and capicola. 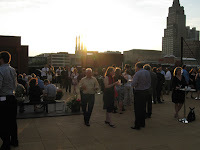 As the sun began to set, The Test Kitchen's Founder called together all the Test Kitchen Disciples (that’s people who have previously attended a Test Kitchen event) to lead the rest of us Newbies in The Test Kitchen Pledge. With 60 people in attendance tonight, whereas most events have hosted closer to 20, this was the largest number of people to take The Test Kitchen Pledge and be initiated at one time. Then we were given our pledge pins. I can't imagine this is all that different from Skull & Bones. After one more Equinox, it was time to scoot. 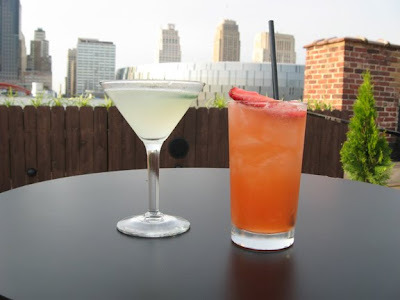 We thoroughly dug the Ultimate Cocktail Party, and I’m going to have to set aside some scratch to splurge on an upcoming Test Kitchen event. Until then, Chef Hanna, can you please make the Shaw vs. 40 Arancini Challenge happen?